1000 GPUs is equivalent to running a continuous 10% load on one processor for the month. You can use up to 2.78 GPU's per hour and not go over the 2,000 GPU limit. NOTE: The above numbers are based on a 30-day calendar. These numbers will vary based on actual calendar days for each given month in your billing cycle. GPU totals that rise over the allotted 2000 in a billing cycle will incur an overage fee of 10¢ per GPU. Click on the Admin button for your Grid account. 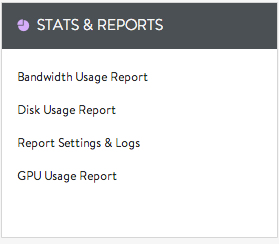 Click on the GPU Report item under the Stats & Reports section. The top of the GPU tool offers the ability to navigate between billing cycles. You can use the arrows at the bottom right and left to switch cycles. The GPU tool will typically only store GPU data for the past 3 billing cycles. Earlier billing cycles may not display. How do I view data for individual days? To do this, just click on a data-point on your GPU graph. This will change the data shown in the table below to reflect a single day. You can single out the days with the highest GPU usage to see where your overages are coming from. What do all these details mean? You can hover over the title of any column (e.g. "IORead or IOWrite) to see what it means. Why are some rows yellow? This means this row has a suggestion. Hover over the yellow triangle (!) to see what the GPU tool thinks about this data. Why do I have high GPU usage? Although the number of variables that can cause GPU usage are complex, experience has shown that major GPU drivers are usually caused by site scripting problems or by substantial traffic surges. While the Grid is designed to handle major traffic surges with minimal issue, script-heavy, database-driven websites will almost certainly use more GPUs than simple, static HTML pages. If you are using third-party software, look into their documentation or their community forum. Try searching online using phrases like "php optimization", "optimizing WordPress", etc. Try disabling plug-ins or add-ons to your site. After a few days, you might see a reduction in GPU usage. Utilize caching whenever possible. Popular CMS programs like WordPress have caching plugins available. Caching can lead to immense reductions in usage with very little effort. If you see high usage from favicon.ico, robot.txt, or other missing system showing a "404" error, this is because most popular CMS software has to do work to generate the 404 on every attempt to reach the missing file. Create a static file for each of these to reduce the resource usage from this error. How do I reduce my GPU usage?